OCALA - Wildlife officials in central Florida say nuisance bear reports were up last year and believe an increase in both human and bear population is to blame. In and around Ocala National Forest, where the most black bears live, the number of human-bear encounters has quadrupled, according to a Florida Fish and Wildlife Conservation Commission. The number of bears killed on Florida highways is going up, too. Through the end of November in the Ocala-area wildlife district, 676 nuisance bear complaints were lodged, compared with just 155 nuisance bear reports in the district in the previous year. Scientists say as the human population in the area grows, people are moving into bear habitat, making encounters with the animals more likely. "A bear goes to find his favorite acorn tree and it finds a Wal-Mart parking lot instead," said Don Coyner, a wildlife biologist for the Ocala FWCC office. Deaths of the bears on north and central Florida highways are also on the rise. In 1999 forty eight bears died on highways in the region. By the end of November last year, 67 had died on central Florida highways. 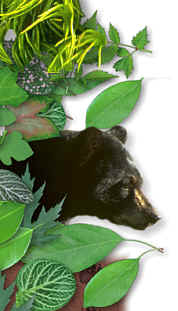 Bears are less active this time of year - although the bears in Florida don't go into frill hibernation. Scientists say an ongoing drought may also be forcing bears to range wider in their search for food, leading them into neighborhoods. Florida officials say there's never been a report of a black bear attacking a person in the state.